Darrell Issa’s search for scandal: Republican efforts to find more IRS misconduct is becoming farcical. Some people see a routine bureaucracy doing its job. 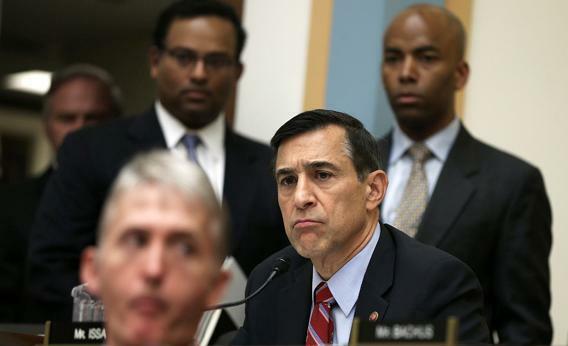 Rep. Darrell Issa sees a scandal. U.S. Rep. Darrell Issa, R-Calif., at a House judiciary committee in May. Issa was going fishing, but fishing for what? The allegation here is that the FEC’s counsel might have asked not just for the tax-exempt status of a group—that’s public information—but for something private. The IRS then might have responded with private information, though the emails released thus far don’t indicate that. Weintraub has said she’s “not aware of requesting or receiving any confidential taxpayer information,” and while flank-covering statements from public officials don’t have a 100 percent record of accuracy, Weintraub has also requested that the FEC’s inspector general conduct an “impartial, independent review” of the scandal charge. She announced this a day before the Issa letter; for some reason, Issa’s play got more media attention. Whether the staff is allowed to answer requests from other agencies—that’s a much smaller question. Unless you’re a real FEC wonk, you might wonder what makes this fishy at all. The answer is in the FEC’s current rules, and in a push by Republicans (like McGahn) who want to tighten them. The rules are already tighter than campaign finance reformers would like them to be. To conduct an investigation, technically, a majority of FEC commissioners, split equally between Republicans and Democrats, have to agree that there’s a “reason to believe” (RTB) it’s worth doing. Republicans have fought to enforce that and prevent more independent staff investigations. “Congress did not intend for the Commission to conduct an investigation before finding RTB,” wrote McGahn in a July memo, before a meeting to discuss possible rule changes. This is how a fairly complicated story of bent rules, deadlocked regulators, and enforcement memos became a very simple scandal. Lois Lerner worked for the FEC counsel’s office; Lerner then went to the IRS’s tax exemption office. Until proven otherwise, it can be assumed—as National Review assumed—that Lerner disobeyed “Rule 6103, which prohibits the IRS from sharing confidential taxpayer information.” As the tax policy journalist David Cay Johnson has pointed out, the info requested by the FEC in the exchange with Lerner was already supposed to be public. The scandal will burn anyway. Maybe a bowel-deep investigation of the FEC will find political collusion; likely, it won’t. But it will find evidence that FEC staffers are running questions when Congress has told them not to. That elevates the internal dispute inside the FEC to a controversy that will outlast Donald McGahn. The drip-drip of stories about Congress investigating “possible collusion” are a win for Republicans, too. As Brendan Nyhan’s been pointing out, most of the mainstream media’s coverage of the IRS scandal happened in its first two weeks. “Is the White House behind this?” was an irresistible story; “Nope, it wasn’t” is a very resistible story. But while everybody moves on, you can put a lot of fear into the bureaucrats.